W. Epstein, The Metatheoretical Context. B. Gillam, The Perception of Spatial Layout from Static Optical Information. J.E. Cutting and P.M. Vishton, Perceiving Layout and Knowing Distances: The Integration, Relative Potency, and Contextual Use of Different Information about Depth. S. Rogers, Perceiving Pictorial Space. J.S. Lappin, Visible Information about Structure from Motion. J.T. Todd, The Visual Perception of Three-Dimensional Structure from Motion. D.R. Proffitt and M.K. Kaiser, Perceiving Events. W.H. Warren, Jr., Self-Motion: Visual Perception and Visual Control. P.J. Kellman, Ontogenesis of Space and Motion Perception. F.L. Wightman and R. Jenison, Auditory Spatial Layout. M.T. Turvey and C. Carello, Dynamic Touch. Chapter References. Subject Index. During the past 25 years, the field of space and motion perception has rapidly advanced. Once thought to be distinct perceptual modes, space and motion are now thought to be closely linked. 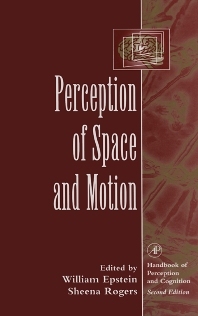 Perception of Space andMotion provides a comprehensive review of perception and vision research literature, including new developments in the use of sound and touch in perceiving space and motion. Other topics include the perception of structure from motion, spatial layout,and information obtained in static and dynamic stimulation. Academics and researchers studying psychophysics and perception, vision researchers, and cognitive psychologists.